GST Implementation is around the corner and companies waiting for the government’s final decision on GST rollout. We are here to help you clear the confusion and guide to in phase wise manner to adopt the tax transformation. We at YASH Technologies have built a GST – Center of Excellence to help our customers adopt technical and functional changes of GST. Our SMEs can help you understand the key areas of impact to your business model and prepare different scenarios for the design and application of GST. Do not wait for the upcoming GST rollout deadline to start the process of migration. As business and technology impact assessment along with the mandatory tax procedure migration will take several weeks to come to fruition. Get ready now for enabling this change in a smooth and seamless manner. India has taken a quantum leap to rebuild itself as a powerful and business-friendly economy. In this quest, India has aptly addressed its primary concerns and pushed its first set of economic reforms. Among the many planned reforms, the Goods and Services Tax (GST) reform will be a stepping stone in restoring the Indian economy. Complete the pre-requisites well before time. 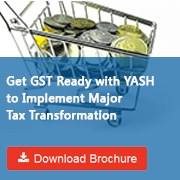 Your GST implementation guide is already waiting for you. Let’s get started. Copyright @ 2017 YASH Technologies. All Rights Reserved.